We celebrate the summit finishes and often forget the roads the roads that preceed them. Today’s the chance to venerate a climb that’s used en route to many a Tour de France stage finish and it’ll be scaled twice next July. It’s worth riding for its own sake and ideal to combine with other high mountain passes in the area. The Route: the D927 starts from the village of St Etienne de Cuines just above La Chambre. Here it proceeds south-west for 19.7km to the summit at 1924m above sea level with an average gradient of 7.3% and a maximum of 11%. There are other routes, more of which below. The Feel: there’s no mistaking the start, large road signs signal the route, the col itself rather than a ski resort or a large town over the other side. Big signs mark the importance of this climb but recognition isn’t just for the Tour de France. It’s signposted for drivers and motorcycle touring clubs with whom you’ll have to share the road during the holiday months of July and August. It’s packed with cyclists too. There’s a fountain after a couple of kilometres on the right. 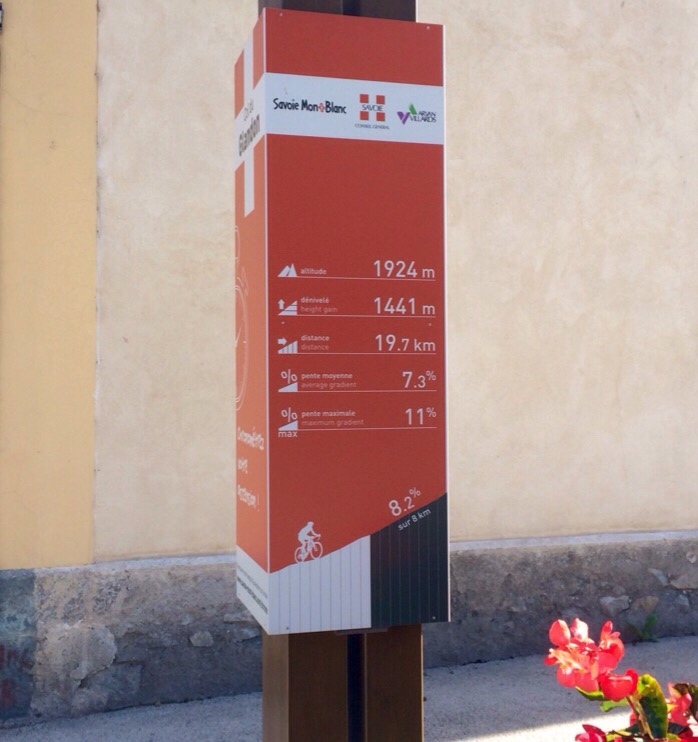 Every kilometre is marked by a borne showing the distance to the top and the gradient for the next kilometre, a great initiative that’s found across the Alps and Pyrenees. Here the markers tend to say the same thing most of the way up. It’s a very regular climb from the start, an hors catégorie climb that’s accessible for non-climbers, or at least the first part gives this impression. After a few cracks and bumps leaving the town the road is wide and well-surfaced, the consistent gradient allows a rhythm. In time the village of St. Colomban des Villards arrives – if you didn’t get into a rhythm there’s a café for a breather – and with it a flat road, here the gradient eases. Leaving the village the road rises suddenly and the tone is set for what’s to come. There’s a stunted forest, the altitude curtailing the vegetation as the road picks its way past the Glandon river, from which the pass takes its name, by now a rough torrent. Higher up and the terrain opens up, be sure to take in the views and look for marmot. As you scan the horizon now you’ll look up and wonder where the road goes, the spiky ridge looks too high to pass. The road has traced the white water torrent up its valley but the last part sees the road zigzag to scale the valley walls and this is the hardest part. Too long to sprint, especially with the altitude and accumulated effort, it’s a slog but rewarded with views down the valley and all the way to Mont Blanc, the Alps’ highest peak. 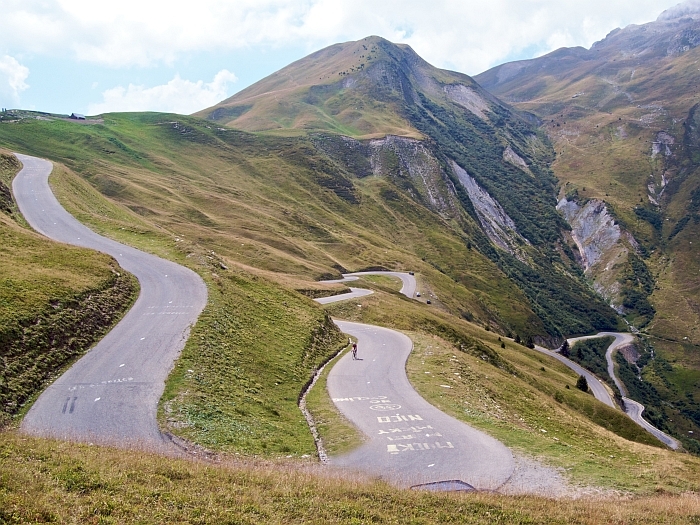 Sister climb: the Col de la Croix de Fer runs parallel to this climb a few kilometres to the east but the Glandon has to be the superior road to climb. It might not be as high but the Croix de Fer features busier roads and ugly ski resorts on the way, although its upper section is stunning and offers huge views so it’s hardly the ugly sister. Climb the Glandon and you can ride across to the Croix de Fer for little extra cost to enjoy the views. On the south side of the Glandon one road climbs up the valley from Allemont and forks in two at the top leaving you the binary choice of the Glandon or Croix de Fer. Ride More: ride this road and suggested and at the pass there are many other routes available. Having ridden up from St Etienne de Cuines you can turn back down the same road but for little extra cost you can see more. Continue for the briefest of descents to a road junction where you can turn left and climb the final section to the Col de la Croix de Fer at 2,067m. Then descend for more choices, for example turn off on the right for the Col du Mollard or on the left further down to tackle the climb to La Toussuire, a recent Tour de France regular but otherwise not too glorious. You can do both, first the Mollard and then emerging near the start of the road to La Toussuire. Alternatively you can descend the Glandon to Allemont but this probably requires a ride back up unless you fancy a very long loop via the Lautaret and Galibier. History: and obvious crossing between the Maurienne and Romanche valleys and presumably has been route since ancient days. In more modern times the Tour de France first climbed it in 1947 and the Tour has crossed 15 times (Wikipedia says 14 but in 1983 they rode up it twice). The descent to Allemont leads the race towards Alpe d’Huez and typically the Glandon has softened up the race rather than decided it. As softening up exercises go the Glandon is a sledgehammer-sized meat tenderizer. In 2001 Jan Ullrich and his Telekom team noticed Lance Armstrong looking tired on the way to Alpe d’Huez. 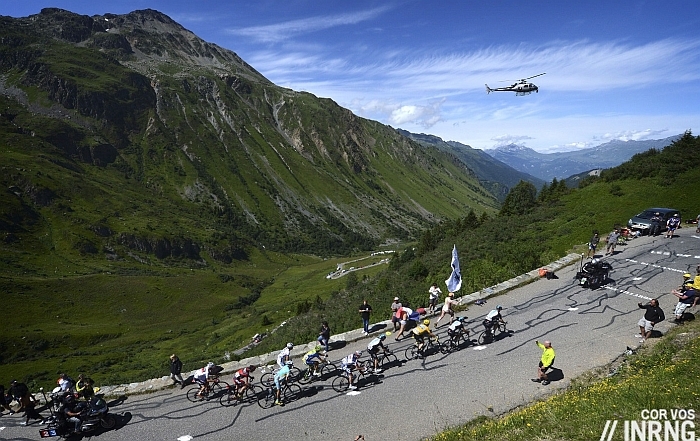 Telekom put their riders to work on the Glandon and set a fierce pass. But Armstrong had been bluffing and once Telekom’s riders had been burned up he left Ullrich floundering the slopes of Alpe d’Huez. Frenchman Bernard Thévenet said he hated the Glandon because it always got the better of him. But in 1977 Dietrich Thurau took off on the climb en route to Alpe d’Huez. Thurau had worn yellow earlier in the race but surrendered it to Thévenet and went solo in search of the race lead. A time trial specialist, he pulled out a good lead on the early part of the climb but the upper section and its steep slopes got the better of him and he cracked allowing Thévenet to put time into him and ultimately win the Tour. Thévenet’s tactics were useful for the everyday rider: take the first half steady even if the road invites you to attack it; save energy for the final five kilometres. When to Ride: the images above and below are taken from the same spot by @cyclingchallenge, just the season differs. At nearly 2,000m high the road is closed for as many months of the year as it’s open. Spring might reach France in March and April but it doesn’t get to the high Alps until later. 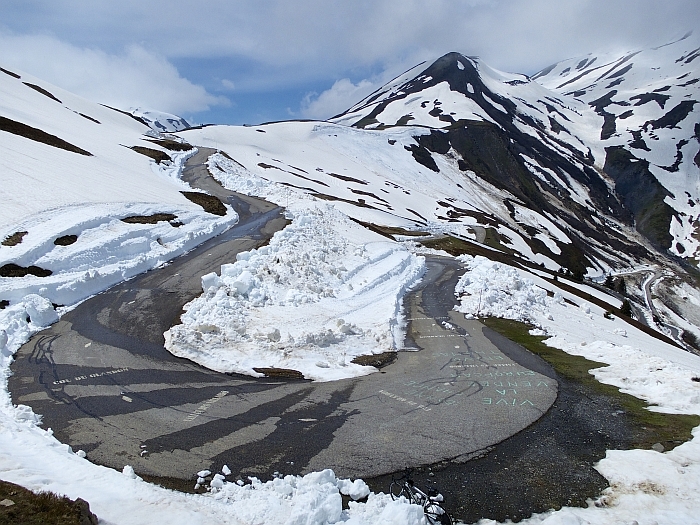 The Glandon tends to open in mid-May but don’t rush as walls of snow await and rockfall can litter the road and once you can ride up it’ll be very cold on the way down. June is better, July and August are popular, read busy, and September is fine while October will get harder with each passing day. All times of year it can be cold at the top, pack a jacket for the descent. Fact: the Maurienne valley is one of those rare places not to take its name from a river. The origins of the name are disputed but it’s the Arc river that flows down the valley. The northern ascent of the Glandon is one of the most “deserving” climbs I know. And I have ridden it some ten times almost always after the Madeleine. It makes you suffer especially the second half. But it’s so beautiful up there! A very remote and wild scenery. The gradient during the last 2 k’s averages around 11%, but there are sections with 14 to 15%, so it’s always hard even if you know what to expect. My most favorite aspect of that mountain though is the high speed descent to Allemont interrupted by that little, painful climb in between. It incorporates some turns which you can approach in excess of 80 kph only to find out that you don’t have to brake if you lean over hard enough. A good thrill. I always applaude the French road construction engineers after a ride like this. I suppose most of them are either “cyclistes” or “motards” ;-). The other time to ride Glandon is the annual car-free day sponsored by the regional tourist office (was Aug 29 this year – it’s usually just the morning). Never remotely crowded, everyone is in good spirits, and cycling this beautiful climb in silence is special. Rode this as part of l’etape du Tour in 2012 and then from the other side in the Marmotte in 2013. The Northern approach (as described) is definitely the most difficult, but also by far the most rewarding. INRNG – keep up the good work, fantastic blog! Take in the sights make a day of it and climb Glandon from Allemond, near Borg d’Oisans and then light it up on the descent, and on to La Chambre and then start up Col de la Madelaine. After descending again get some of the best tasting icecream in La Chambre. You then know you are alive! The Allemond side, with the dam, is gorgeous. My first ride in the Alps was that side of the Glandon and then looping back, suffering across the Croix-de-Fer. The Maurienne side is stunningly beautiful. One of my favourite places to ride a bike. We who live in the new world, suffer in silence and envy. Well you’ve got spring and summer coming while the Glandon and others are going to be closed to traffic for six months. Next post: War, What is it Good For?